As some of you know, I speak, create content, blog and consult on the issue of resilience. More and more people I talk to are very interested in how they can strengthen their resolve to bounce back and thrive in these uncertain times. I try to stay on topic and focus on what I believe are core competencies of resilience: communication, collaboration, adaptation, and imagination. All my posts are organized around those with a few miscellaneous posts thrown in for grins. 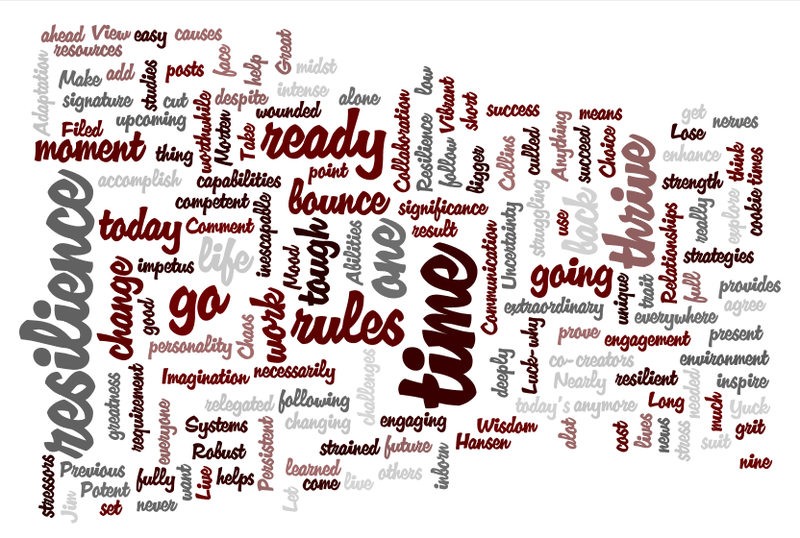 So, here is a visualization of my posts for the month of November 2011 created by Wordle. If you had to visualize in words your month of November, what words would you come up and which ones would be the major focus for you? I’d love to read your comments!